Save time, labor and valuable work space with the Easy Tomato Slicer. A full-size machine, its highly efficient design takes 60 percent less counter space than other, bulkier units. Razor-sharp blades cut with trouble-free precision, thanks to a unique self lubricating track material that resists misalignment problems that cause nicks and broken blades. Vertical handle and protective guards improve user comfort and safety. Cleans up quickly and easily. Scalloped blade option available on all models. 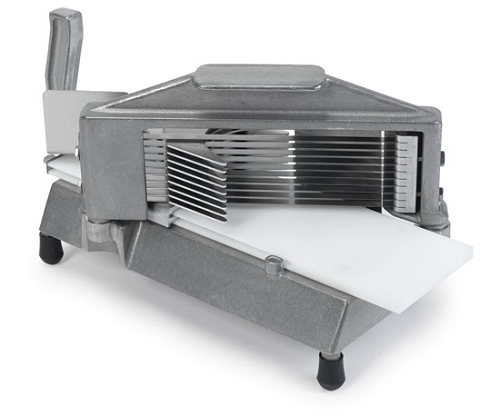 Nemco makes the best tomato slicer!